The fun begins at the Flip Flop Inn! - FREE Beach Serv. In Season Mar - Oct! 3 Bedroom 3 bath with sleeping for 10! Flip Flop Inn is a new home in popular and beautiful Beach Retreat. Two-story, three bedroom/three bath beach cottage with oversize wraparound balconies sleeps 10 people. Located in a gated community with pool, hot tub and gym, just 200 yards from private beach access to the sugar white sands and emerald Gulf waters. Pool is heated from October through March! We also provide Beach Set up Service in Season, Mar - Oct. Located along one of the most desirable beaches in the nation, Beach Retreat is a family-oriented beach community located on Scenic Gulf Highway and in the heart of beautiful Destin, where the sand is like sugar and Gulf waters are clear and emerald green. Beach Retreat is centrally located to all of Destin's wonderful restaurants, water sports and activities, including Silver Sands outlet mall, Sandestin and Baytowne Wharf, Destin Commons, Big Kahuna's Waterpark, The Track, upscale shopping, casual and fine dining, movie theaters and beautiful golf courses. First Floor: On the first floor of the home is a beautifully furnished living room and a kitchen with stainless steel appliances and granite counter tops. The kitchen is fully equipped so you can cook as if you were at home, and the large dining table provides plenty of room to serve a big meal. Additional seating is available at the eat-in bar. Also provided is a sound system with a radio which plays CDs and MP3s so bring your iPod! Also on the first floor is the first of two master bedrooms with a King-sized bed and flat-screen TV with DVD, attached to a full bath with double vanities. A full-size washer and dryer are located downstairs. Second Floor: On the second floor is a second master bedroom with a King-sized bed and flat-screen TV with DVD, plus an adjoining bath with a whirlpool tub and separate shower. The second-floor master also offers access to the wraparound balcony so you can enjoy a nightcap on the balcony before you slip between the sheets. The third bedroom is also on the second floor and it has two sets of bunkbeds, each one is twin-over-full. This room sleeps a total of six people and is attached to its own full bathroom. It also has a TV and DVD player, and opens to the backside of the wraparound balcony. 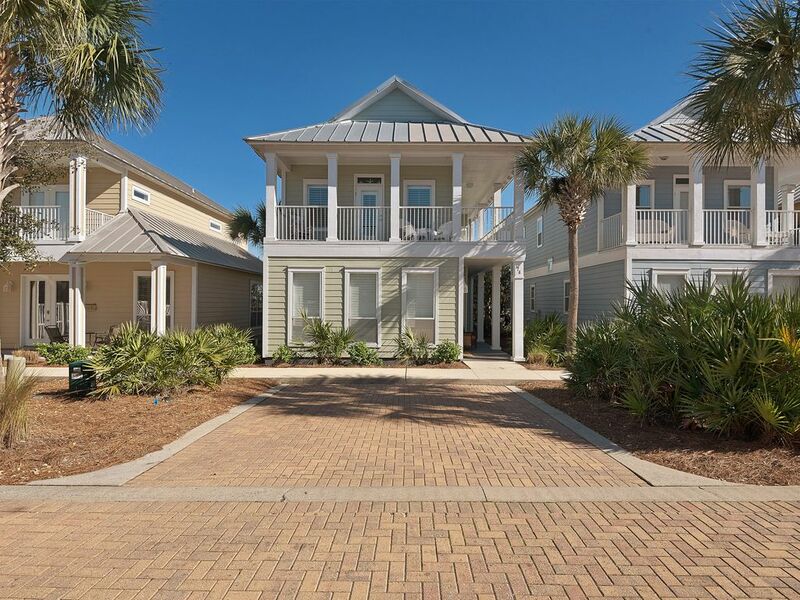 Beach Retreat: Located along one of the most desirable beaches in the nation, Beach Retreat is a family-oriented beach community located on Scenic Gulf Highway and in the heart of beautiful Destin. We offer our guests 300 feet of private beach for Beach Retreat owners and their rental guests only, with umbrella and chair rentals available. Facilities for showering off the sand when returning from the beach are conveniently located at the entrances to the community and the swimming pool. Guests will also enjoy the large swimming pool which includes a hot tub, fountains and lush landscaping. Chaise lounges, tables and chairs are provided for your comfort, and restrooms are located at the pool for use by vacationers and their guests. is located near the pool (with a separate enclosure for the safety of small children) so you have the option to grill your own meals. Our house is only 100 yards from the pool so you can easily carry your food and supplies to and from the pool. Beach service is provided in season! Mar - Oct. This means that there will be 2 chairs and 1 umbrella waiting for you at the beach each day of your stay. You may rent additional ones as well. The BBQ area is next to the pool, no grilling is allowed at the homes. There is parking for 2 vehicles per home. Additional vehicles will need to be parked off site or an extra spot can be rented thru the association at the club house. Call for details The pool is heated during the winter months but stays covered unless the outside tempature is above 60 degrees. Flip Flop Inn was a very nice place. Beautiful home with a great location! We stayed here for spring break in March with our family of two adults and four kids. Our good friends rented the house right next door (Sea la Vie) and we all had an amazing time. The kids loved having all the bunk beds and an extra bedroom to hang out in. They also enjoyed having a TV and DVD player in their room. The walk to the beach was so short and having chair service was a nice bonus. The heated pool was huge and well kept. We went to the beach and pool pretty much everyday! We also walked to several restaurants including Pompano Joe’s (favorite), Kenny D’s and the Whale’s Tail. We loved being on the end of the cul de sac so the kids had a big area to play in. We took Kathy’s recommendations for a couple of excursions - parasailing by Just Chute Me and AJ’s sunset dolphin cruise. Both were so fun and well worth it. The home was clean, spacious, bright and the kitchen was well stocked for cooking. We did not bring our dog but it was great to have that as an option. Kathy was very responsive and a gracious host. We would love to rent here again! My family stayed here for our Thanksgiving trip. The house is the perfect size for my family of 5 and is in a great location, right across from the beach! Everything was clean and Kathy stayed in touch with us before and during the trip. We would definitely stay here again when we return to Destin. I am so pleased that you enjoyed your stay at the Flip Flop Inn! Thank you for taking the time to write this lovely review as well!!! I hope you will come back again soon. Everything was wonderful! 2 min walk to the pool and 5 min walk to the beach. Spacious and clean home in a beautiful gated complex with a HUGE pool. Will definitely be back. Thank you for submitting this review! I always post that it is a 1 minute walk to the pool and a 3 minute walk to the beach, I will check it out to see if I need to revise it! I am so pleased that you enjoyed your stay!!!! I hope you will come back again soon! Very Nice property! Beautiful area! Great folks to rent from! Even with bad weather part of the week we really enjoyed our stay at the Flip Flop Inn. The house has plenty of room and was very clean upon arrival. The neighborhood is very nice and neat. We would definitely stay here again. I am so pleased you enjoyed your stay despite the couple of rainy days! I hope you will come back again soon!!!! We loved the Flip Flop cottage at Beach Retreat! Kathy is a wonderful host, and is very attentive to the needs of the guests, and is so friendly. The place is clean, perfect for guests to relax and enjoy, not needing to worry about anything - the place is well stocked! Love the proximity of the pool and beach. Highly recommended! Thank you for this lovely review! I hope we see you again soon! Call me anytime you are ready to come back to Destin! Professionally managed by JSRE/Kastle Keepers LLC We require $150 for a pet fee.